Here’s a new piece of fan art that totally falls into the ‘fan art done by an artist way better than me’, this one by amazing Canadian artist Aldevoir. And I gotta say, this looks like Puck! 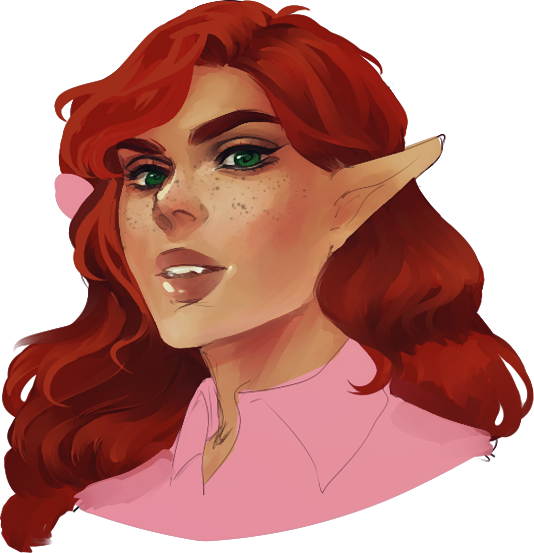 I mean, it’s easy to draw red hair and add some freckles and call it a day, but actually making a face look like Puck’s is (for mysterious reasons) kind of hard. Heck, sometimes I don’t do a very good job of that myself. And this pic really does get the likeness down. I’m impressed. And wish I could borrow some talent from this bottomless talent pool. Yes, faces are hard to draw, because the Human Brain is Hard-Wired to recognise FACES – and to instantly discern even the tiniest details of proportion. It’s actually the same part of the brain that all too easily “sees” human faces in Rocks, Clouds, Oil Stains. The “Faces” are not there – not real – but the Human Brain “wants” them to be. As to this beautiful pic, what’s up with Robin’s RIGHT EAR ? I’m thinking this was drawn electronically, and the “FILL BRUSH” grabbed the wrong colour. That’s not an ear. That’s a bow. See? Attention to detail. Has Robin ever worn a Bow ? Many, many times. She always has on her right temple a bow or a hair clip, which keep the front lock of hair in place. Thot ’bout this – a lot. I maintain it STILL looks better as an EAR. @Salem: The same part of the brain (or next door to it) that hears words in bird song. Birds don’t talk to me. Is that wrong? I do not know Stjepan Sejic, but if his comics feature too many redheads, that sounds like the right number of redheads to me.